Once again, Chicago Film Archives and Northwest Chicago Film Society join forces to present CHICAGO HOME MOVIE DAY at the Chicago History Museum. Home movies provide invaluable records of our families and our communities: they document vanished storefronts, questionable fashions, adorable pets, long-departed loved ones, and neighborhoods-in-transition. Many Chicagoans still possess these old reels, passed down from generation to generation, but lack the projection equipment to view them properly and safely. That’s where Home Movie Day comes in: you bring the films, and we inspect them, project them, and offer tips on storage, preservation, and video transfer–all free of charge. And best of all, you get to watch them with an enthusiastic audience, equally hungry for local history. We’re also very fortunate to have silent film pianist extraordinaire, David Drazin, on-site to tastefully accompany your moving histories. 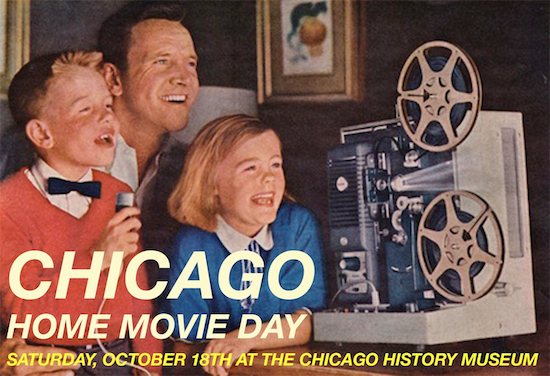 Chicago Home Movie Day is dedicated to YOUR home movies. From 11:00AM until 1:30PM archivists and projectionists will inspect and project all celluloid home movies that walk in the door. We encourage all providers of these gems to introduce their films to an eager HMD audience. From 1:30PM to 3:00PM, there will be a curated screening of home movies from the CFA and NWCFS collections that spotlight Chicago’s Hyde Park neighborhood and local railroads & trains. Highlights include a pet city goat named P.D. (short for Prosperity/Depression), toddlers tumbling down the boulevard and a “League of American Wheelmen” cycle train excursion to Beloit, Wisconsin. Do you have any celluloid home movies that fit our themes? Even if they don’t, we’d love to include them! Give us a call at 312-243-1808 or just show up with those 8mm, Super8mm or 16mm reels.